Our selection of fire pits and outdoor fireplaces was curated for any patio décor and outdoor occasion. We work directly with our manufacturers to design a variety of fire pits with extremely affordable prices. These fire pits are stylish and functional. Each fire pit will bring your patio warmth and ambiance your family and friends are sure to flock to. High-temperature rustic patina paint is resistant to heat & adds traditional charm. Fire pit Screen can be easily moved for making cooking over the fire. - Outdoor fire pit measures 33 x 33 x 17 inches overall including ring and spark screen and weighs 36 pounds. - This wood burning fire bowl has delicate hole so it can be enjoyed with friends and family outside on your porch, patio or in your backyard. 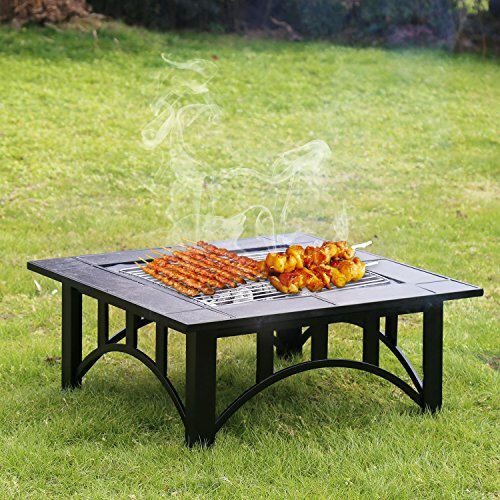 - This large fire pit features a durable .7mm steel construction finished with a rustic patina colored high temperature paint for a heat resistant finish. - Beautiful ceramic tiles are attached to the edges of the tabletop. - Steel construction makes the fire pit ultra durable & long-lasting.